Image caption The Disasters Emergency Committee said Gaza was "on the edge"
British aid agencies have launched an emergency appeal for people affected by the conflict in Gaza. The Disasters Emergency Committee (DEC) said: "After four weeks of terrible fighting... over half a million people have been forced from their homes." The DEC said its member charities were "rapidly increasing" the assistance provided during the current ceasefire. The BBC and Sky chose not to broadcast a DEC Gaza appeal in 2009. The BBC said the current situation was different. More than 1,800 Palestinians, mostly civilians, and 67 Israelis, mainly soldiers, have died in the conflict and an estimated 520,000 have fled their homes. The DEC said that after a month of fighting the "humanitarian emergency" in Gaza was affecting every inhabitant. Many people have no access to water or sanitation, said the DEC. The DEC, an umbrella organisation which brings together 13 UK aid charities to deal with international crises, said donations were already being accepted through its website and using a 24-hour phone line. It will broadcast an emergency appeal on the major television networks on Friday. 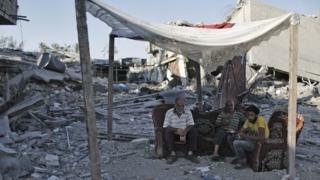 DEC chief executive Saleh Saeed said: "After four weeks of terrible fighting Gaza is on the edge. Over half a million people have been forced from their homes, and one and a half million have no or very limited access to water or sanitation. "Many people are living in terribly overcrowded UN shelters, but they still need food and basic household items which we take for granted. Many are in urgent need of medical care, but hospital supplies are almost finished. "Even before the conflict began, the people of Gaza were close to breaking point. Now we are seeing a humanitarian emergency affecting virtually every man, woman and child in Gaza. "The DEC's member agencies and their partners are on the ground but they need funds to meet the huge needs. They are relying on the generosity of the British people to make a difference." What caused the latest escalation? Rocket fire from militants in Gaza and Israeli air strikes on the territory increased after the abduction and killing of three Israeli teenagers in June, which Israel blamed on Hamas and which led to a crackdown on the group in the West Bank. Hamas denied being behind the killings. Tensions rose further after the suspected revenge killing of a Palestinian teenager in Jerusalem on 2 July, after which six suspects were arrested. On 7 July, Hamas claimed responsibility for firing rockets for the first time in 20 months, after a series of Israeli air strikes in which several members of its armed wing were killed. The next day, Israel launched Operation Protective Edge, which it said was aimed at stopping rocket attacks and destroying Hamas' capabilities. Since then, there have been thousands of air strikes and thousands of rockets have been fired. The DEC said some agencies had worked through the fighting, while others had responded during lulls in the conflict. Oxfam is already delivering safe water to up to 175,000 people per day and British Red Cross partners are supporting emergency medical services, it said. In 2009, the BBC received thousands of complaints after it decided not to air a DEC fundraising appeal for Gaza, saying it wanted to avoid compromising public confidence in its impartiality. Sky News also refused to broadcast the appeal but it was shown by ITV, Channel 4 and Five. In a statement, the BBC said it had taken "three issues" into consideration after being asked to broadcast the current appeal. "The disaster must be on such a scale and of such urgency as to call for swift international humanitarian assistance; the DEC agencies must be in a position to provide effective and swift humanitarian assistance at a scale to justify a national appeal; and, there has to be reasonable grounds for concluding that a public appeal would be successful," it said. "We also have to consider our Charter obligation of due impartiality. After careful consideration we believe these criteria have been met. "The humanitarian need in Gaza has been widely acknowledged, including by the Israeli government, and the DEC has given assurances that aid can reach those who need it. "The BBC will continue to report impartially in our coverage of the story in the Middle East." Israel has offered to extend the three-day ceasefire which began on Tuesday after nearly a month of conflict, but there has so far been no agreement from Hamas. Meanwhile, Downing Street has said a review of arms export licences to Israel is under way. The Liberal Democrats have called for any existing licences to be suspended if violence breaks out again. Foreign Office Minister Baroness Warsi resigned on Tuesday over the government's stance on the conflict, calling it "morally indefensible". But David Cameron has defended government policy, saying he has been "consistently clear" in calls for peace.